Community energy is a hugely exciting opportunity with growing support. 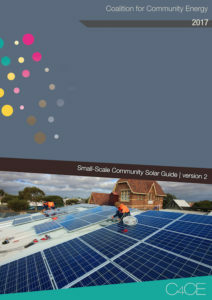 However, there are still significant barriers to realise the full potential of community energy in Australia. 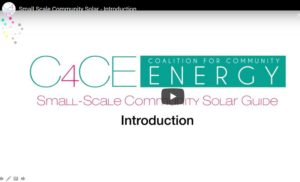 That is why the organisations at the forefront of the emerging community energy sector in Australia have founded the Coalition for Community Energy (C4CE). The Coalition for Community Energy was founded using a Collaborative Impact approach and credit needs to go to Nicky Ison and the team at Community Power Agency who have worked tirelessly to bring the organisation to life. C4CE facilitates collaboration. 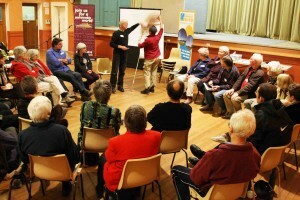 It’s Strategic Initiatives and Congress build on the strengths of its member organisations ~ community energy projects, groups, support organisations and stakeholders in the wider renewable and mainstream energy system ~ to create mutually beneficial outcomes. 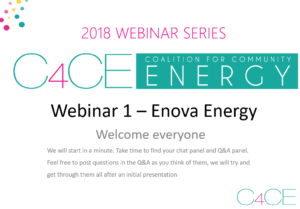 C4CE fosters win-win situations and in so doing is creating a quicker, more efficient path to a community energy sector with hundreds of community energy projects that benefit all Australian communities. C4CE initiatives are created and led by one of more members. The overall coordination of C4CE is led by the Steering Group with the support of a Secretariat. C4CE believes collaboration creates greater impact than the simple sum of individual member efforts. Together, we can make the difference. While it was unincorporated, C4CE was auspiced by Starfish Initiatives and then ATA – their support has been hugely appreciated and has helped the organisation become established. As C4CE becomes Embark Australia Ltd, the new organisation will trade as Coalition for Community Energy and benefit from DGR status, which means your donations are now tax-deductible.